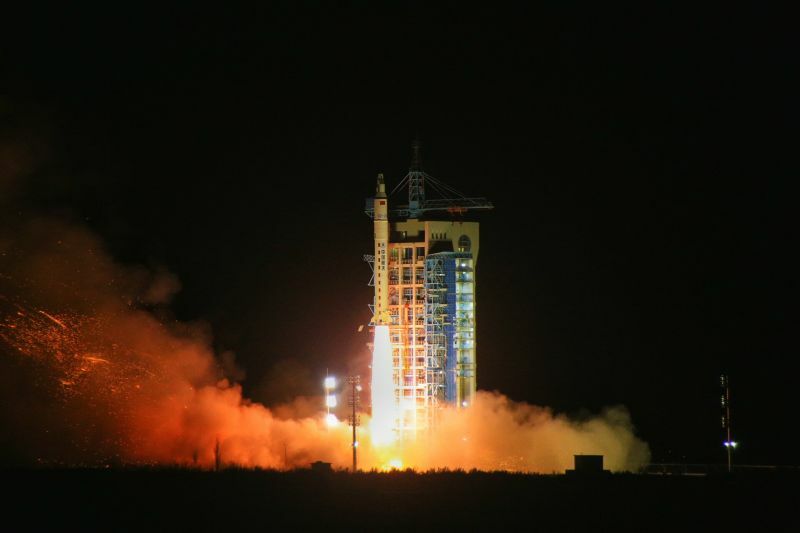 JIUQUAN, Gansu, April 6 (Xinhua) -- China put into space a retrievable scientific research satellite in the early hours of Wednesday in a fresh bid to aid scientists back on Earth in studying microgravity and space life science. In a cloud of brown smoke, the satellite, SJ-10, roared into the air on the back of a Long March 2-D rocket from the Jiuquan Satellite Launch Center in northwestern China's gobi desert. While in space, the bullet-shaped probe will house 19 experiments involving microgravity fluid physics, microgravity combustion, space material, space radiation effect, microgravity biological effect and space bio-technology, before coming back to Earth with results. On-board experiments were selected from a pool of over 200 applicants. They include one that will study early-stage development of mouse embryos in microgravity to shed light on human reproduction in space, and another studying space radiation effects on genetic stability of fruit flies and rat cells. A "Soret Coefficient in Crude Oil" experiment in partnership between the National Space Science Center under CAS and the European Space Agency (ESA) is also onboard together with an investigation of coal combustion and pollutant formation under microgravity. The former test is aimed to improve scientists' understanding of oil reservoirs buried kilometers underground, while the latter is expected to help enhance energy efficiency and cut emissions. "All experiments conducted on SJ-10 are completely new ones that have never been done before either at home or abroad," said Hu Wenrui, chief scientist of the SJ-10 mission. "They could lead to key breakthroughs in our academic research," Hu said. SJ-10 is the second of four scientific satellites under a CAS space program. Unlike the other three, SJ-10 is returnable. It is the 25th such retrievable satellite launched by China in the past decades. Overall, eight of the experiments on fluid physics and microgravity combustion will be carried out in the orbital module and the others in the re-entry capsule which is expected to land at Siziwang Banner in Inner Mongolia, the designated landing spot for China's Shenzhou manned space missions and a 2014 test lunar orbiter.